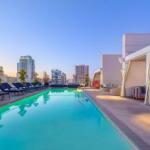 Free Wi-Fi complimentary drinks on check-in and free in-room snacks make Andaz San Diego - a Concept by Hyatt stand out for guests as do the rooftop pool and lounge. The six-story 159-room hotel is designed with a mixture of classic and contemporary styles. You'll be welcomed with a beverage upon check-in before getting settled into your room where you'll find a minibar free daily snacks and 24-hour room service at your disposal. Free Wi-Fi a flat-panel TV and an iPod docking station help you customize your electronic experience; and a 24-hour fitness room and business center keep you up and running with your workout and the office. The glass-enclosed bathrooms have lush robes for you to wear while you wander around wondering whether to hit the hotel's restaurant first or go straight to the rooftop pool's lounge and nightclub where guests have VIP status. Valet parking is available for an additional fee. The hotel is in the heart of the Gaslamp Quarter home to San Diego's hottest nightspots and dining. Westfield Horton Plaza with chic open-air shopping is just steps away and there are a handful of theaters within a few blocks. It's a half-mile to the San Diego Convention Center and local transportation picks up right on the corner. San Diego International Airport is less than three miles away.